The Help to Save scheme has been designed to support working people who receive tax credits and universal credit in building up savings. As the scheme is backed by the government, you can rest assured that the money you save is kept secure. 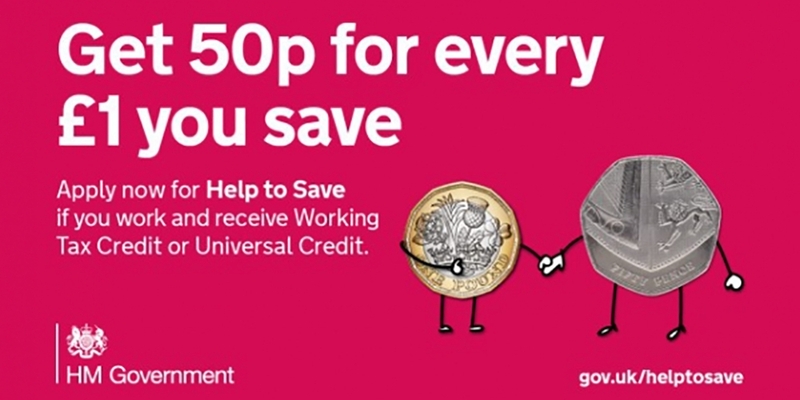 With Help to Save, you can receive a 50% bonus on your savings, meaning for every £1 you save, you’ll earn 50p. Accounts last for four years from the date it’s opened, allowing you to save between £1 and £50 every calendar month. You can pay into a Help to Save account on a weekly, fortnightly or monthly basis to best fit the way you manage your money. Interested in finding out more or keen to open an account? Visit gov.uk/helptosave.